I've been looking forward to writing up a little love letter to the Limpet Stitch. 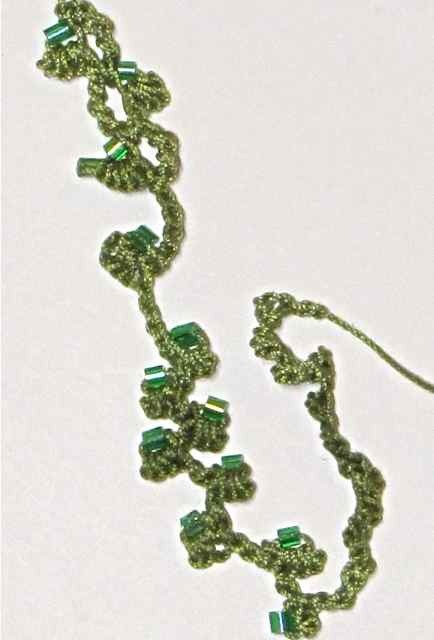 It's not like any other crochet stitch because it is a fundamentally different way to add loops onto the crochet hook. 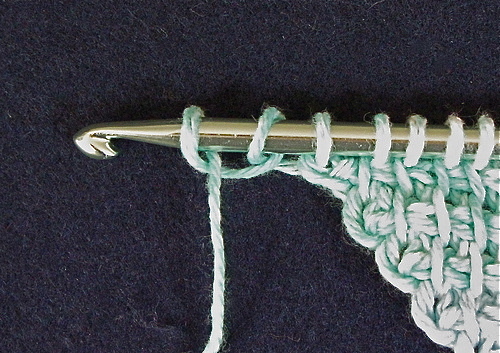 Normally, crocheters "yarn over" (wind or wrap the yarn). Instead, to begin a limpet one adds any number of twisted loops. It's more properly called a "cast-on" than a "yarn over." This little twist changes things dramatically. An argument could be made that twisted loop is borrowed or imported from a different fiber art, because it is commonly used in embroidery, tatting, macrame, and in knitting as a simple cast on; it's often known as a "half-hitch." Margaret Hubert's Complete Photo Guide to Crochet book explains how to do it. So enough about the half-hitch. Try making about 5 of them on your crochet hook, then yarn over normally and pull through all loops on your hook. (I pinch them to make it easier to pull the loop through them all.) Did you make a delicate little cluster? Does it fan out a bit with a bewitchingly frilled-like edge? Try making a few more limpets composed of varying amounts of half- hitches. Everyone's imagination travels in unique ways. In my case I'm intrigued by how limpets look in cotton thread as part of a cord, and also what happens when I use mohair with a jumbo crochet hook. These are worked fairly tightly in size #20 cordonnet thread. They look 1960's Japanese maple in places to me. Closest to the thread end with no beads, the smallest bumps are limpets of only 3 half-hitches each. This brings me to the close of my love letter, and yet another thing I love about Limpets: how stable the strands are. This is an important quality when you use big hooks. The half hitches sort of lock the strands into place and give the Limpet an internal integrity. (This is more than I can say for the half-double puff, which gets pulled out of shape when it's snagged.) In other words, Limpets look more delicate than they are. p.s. There seems to be some confusion about whether the Limpet is a Tunisian stitch. ARNie (Angela Grabowski) describes the limpet as a popcorn variant for Tunisian crochet that she found in a Victorian book, but this just demonstrates how versatile and valuable this stitch is to know. You can add it to Tunisian fabric as easily as to regular crochet. This is the first photo in a small series that I posted on my blog June 6, 2009, for a completely different purpose (scroll down). I didn't realize at the time that this is also how one begins limpets. Margaret Hubert's The Complete Photo Guide to Crochet book offers a stitch symbol for the limpet; at this link, scroll to page 30. See Barbara van Elsen's necklace of stacked limpets. The mossy green stitches in Prudence Mapstone's scrumble are limpets. African Flowers, the crocheted kind: they're all over the internet it seems. There's even a "Crocheting African Flowers" Flickr Group with 600 members, lots of photos, and helpful tips. Here's Heidi's how-to for this pretty motif. 1. Waterlily Layer (link shows 3 ways of wearing this vest-thing--including upside down!). This one is available by size. It has an unusual construction--seamed perpendicularly with big stitch repeats--that would make a pattern unwieldy to use if all sizes were squeezed into a single pattern. Why should I publish an unwieldy pattern if there's a much more pleasant way to go about it? I love being in the driver's seat. 2. Frostyflakes Scarf & Wrap in All Gauges. This is a cornerstart, any yarn amount, edge-as-you-go-and-call-it-a-day kind of pattern. I'm still adding photos to this set; made the white silk one first and thought of it as "frosted flakes" but changed it to "frostyflakes" to avoid trademark issues. Then made a beaded red one and now I can't stop thinking of holly! The white cashmere one looks frosty. Patterns that take into account lots of different yarns & gauges thrill me. I didn't get a chance to write this kind of pattern when I was freelancing for other publishers. 3. I keep forgetting to mention the two interviews I've done recently. If you're interested you can read them online: at Jocelyn Sass' Cute Crochet Cafe, "Meet the Designer Vashti Braha"; and at Renee Barnes' Crochetrenee blog, "Industry Insider Interview." 4. Regrettably I posted 2 dead links in the last newsletter so I need to repost them here with the hope that they are truly clickable this time: Doris Chan's first pattern for girls, the Birthday Girl Skirt, is still the hottest off the press. The other nonworking link was to the photographer, model of the skirt, model's mother, and my friend: Ellen Gormley. 5. And finally, if you're in Twitter, let's link up! Copyright (C) 2010 DesigningVashti Crochet All rights reserved.